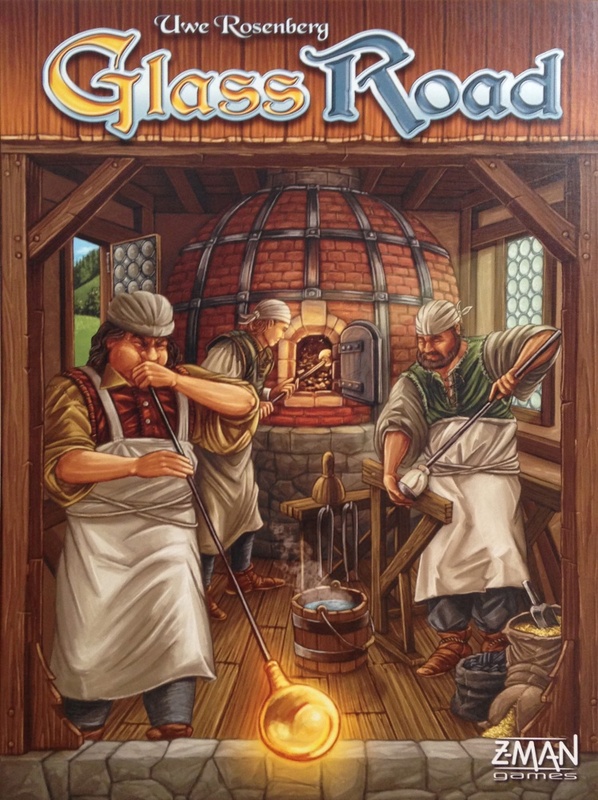 We review Uwe Rosenberg’s newest game, Glass Road. In this resource management and tile laying game, players are trying to build the best glass workshop in Bavaria. Featuring unique mechanics and easy to learn rules, Glass Road is a great new euro game. The first glass makers in Germany were brought there by the Romans, but after they left, it wasn’t until the Middle Ages that Germans rediscovered the art of making glass. By the end of the 17th century, there were about 60 glass factories and the area in the eastern part of Bavaria (in southern Germany) gradually developed into an important center for glass making. Today, in the Bavarian Forest near the border with the Czech Republic, the Glass Road is a 150-mile long path that takes you to many sites where you can see both antique and new glass, as well as picturesque towns and villages with lovely landscapes. There are factories that use the most modern production techniques, as well as small artisan shops that rely on traditional glass making methods. There are also glass museums, where you can see interesting works from the past, and in glass galleries the latest glass innovations can be viewed. You obviously didn’t come here for a history lesson though, so let’s fast-forward to the present. 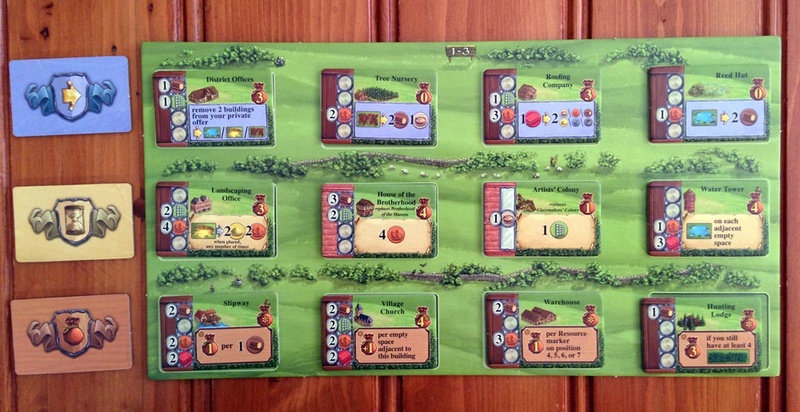 Uwe Rosenberg, one of the modern masters of Euro game design (Agricola, Ora et Labora, Le Havre, Caverna: The Cave Farmers), has taken the theme of glass making in the Middle Ages, and built an interesting game around it: Glass Road. Since I’ve liked so many of his past games, I was really looking forward to playing this one. It uses mechanics we’ve seen in other games (including his own), but it also incorporates an innovative element of his own design: the production wheel. This clever way of tracking resources (first used in Ora et Labora, but given an update here) is one of my favorite aspects of the game. I’ll explain in more detail how it works in the following review, as well as giving a general overview of the rest of the rules of the game. I believe Glass Road is another one of Mr. Rosenberg’s successes. Glass Road is resource management and tile placement game for 1 to 4 players that plays about 20 minutes per player. 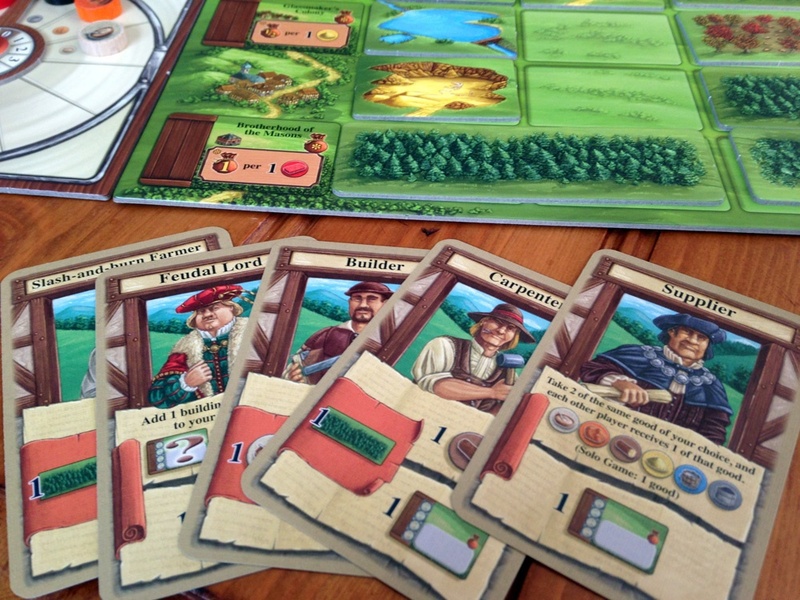 It was designed by Uwe Rosenberg, and was one of his two major games released in 2013 (the other being Caverna: The Cave Farmers). Glass Road plays best with 4 players. In Glass Road, players will strive to produce glass and bricks over 4 building periods, each of which consist of three card-playing rounds. Glass and bricks are considered the major resources in the game, but players will also need to generate other materials in order to construct buildings (wood, clay, etc.). 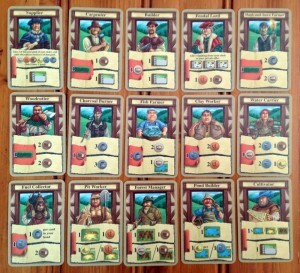 A deck of Specialist cards is used by each player to accomplish varying tasks related to the building process. There is a wide variety of buildings that can be built, each with its own abilities and/or scoring opportunities, and the player that best manages his resources, in order to build the most valuable buildings, will be the winner at the game’s end. 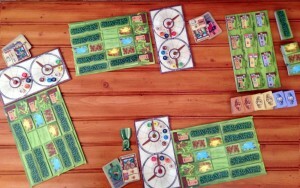 Each player starts with a player board and 2 resource wheels, set at a specific starting amount. 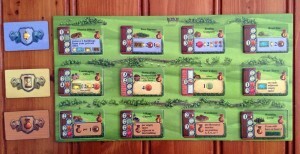 Each player will have a landscape board (where they will construct their buildings), a set of Specialist cards (15 characters with different available actions; each player has the same set of cards), and a production board that displays two production wheels (one for glass production, and the other for brick production). There is also a central building board that will be used to organize the available building tiles (almost 100 total) throughout the game. In addition, each player will cover certain spots on his landscape board with various landscape tiles (Sand Pits, Groves, Ponds and Forests), which can be removed during the game in order to build in the vacated spots. Overall, there is nothing special about the components themselves, lots of standard cardboard here, and a few wooden resource tokens. The artwork is nice to look at, however, and I’ve managed to find several little “Easter Eggs” hidden in some of the tiles (I won’t give any away here, but you’ll have to look closely….they are pretty small). To set up the game, each player will place one resource token of each varying type (glass, brick, wood, water, quartz sand, clay, food, and charcoal) on its appropriately marked spot on the two production wheels. They are situated in numbered sectors that denote how much of each resource is present. In the initial setup, each player begins with a few basic resources, but the “major” resources (glass and brick) are both set at zero to start. Players will also place landscape tiles in the marked spaces on their landscape boards and take a set of Specialist cards. The building board is then filled from a random drawing of building tiles. There are three types of building tiles: blue represents building that can process resources, yellow denotes buildings with a one-time effect, and red displays bonus buildings that award victory points at the end of the game for meeting various goals. The cards in Glass Road each provide two different ways to use them. The key being, if you are the only one to choose that card in a round, then you get to use both abilities. Each of the 4 building periods consists of three card rounds. At the beginning of each building period, each player will secretly choose 5 Specialist cards from among their 15 total cards. These cards can let a player generate resources (which will be tracked on the production wheels), gain or clear landscape tiles, or construct buildings from the building board by paying resources from the production wheels. In addition, there is one card that will allow the player to choose 3 face-down building tiles and place them in his play area to create his own “private” offering (buildings that only he can choose to build). Each card has two abilities on it, and depending on how the cards rounds are played, players may be able to use one or both of a card’s abilities. In each card round, every player will choose a card from their hand and place it face-down on the table. One by one, in turn order, players will reveal their face-down cards and resolve them. 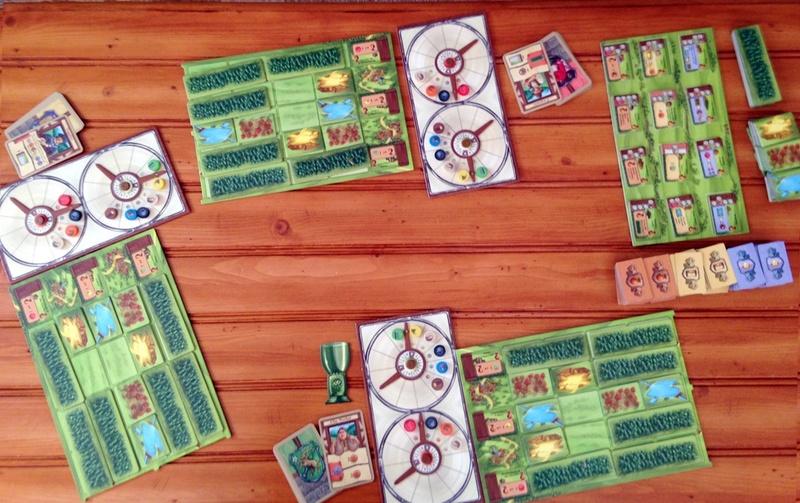 As each card is revealed, the other players must check to see if they have that same card currently in their hands (not played on the table), and if they do, they must play their copy immediately (they are placed in one of the two indentations on the right side of the landscape board). If no one else reveals the same card as a player’s selected card, he may take both actions on that card immediately. However, if any other player reveals a matching card from their hands, only one of the actions on the card may be taken (by each concerned player). After all players have revealed their selected cards and taken their action(s), a second, and then third card round is played the same way. At the end of a building period (after three card rounds), the empty spaces on the building board are refilled from the face-down stacks of new buildings, and the start player marker is passed to the next player clockwise. Players then start a new building period (selecting 5 Specialist cards again from all 15 cards, to use in the new period). The game ends after 4 building periods. At the end of the game, players may use their processing (blue) buildings as many times as they wish before the scoring begins. 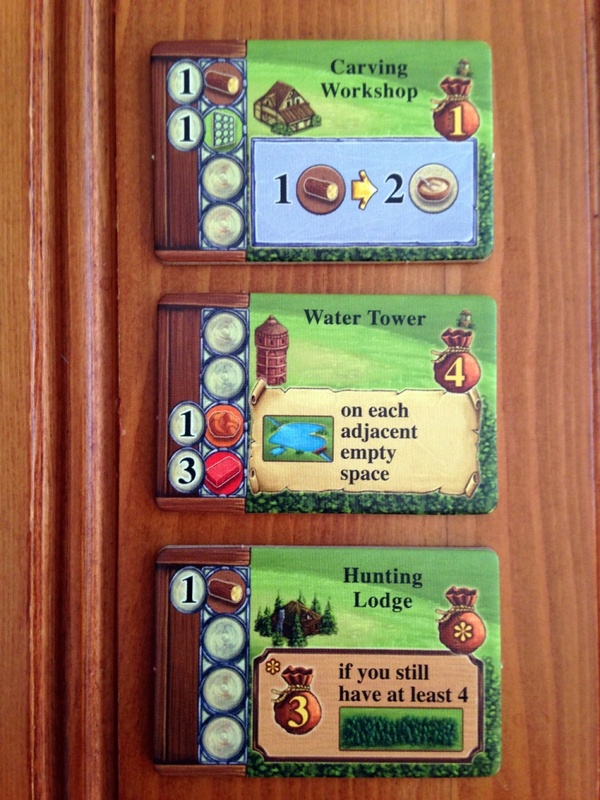 To score, players total the values of their buildings, some of which will depend on requirements such as having certain resources, or even landscape tiles in certain configurations. As usual, the player with the highest score wins. 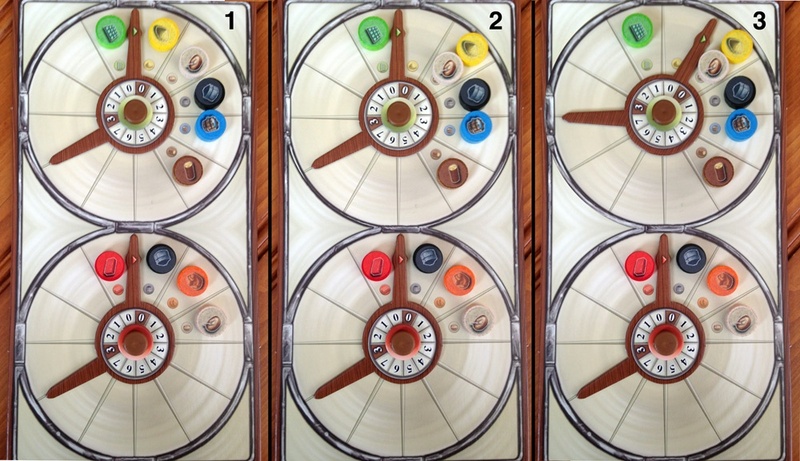 The production wheels are one of the more exciting mechanics in Glass Road. Basic resources are automatically spent to create the advanced resources (glass and brick). Now that I’ve gone over the game play, I wanted to explain the production wheels in more detail. The resource sectors and values are laid out in such a way that increasing certain resources could change the quantities of all resources on a wheel. There are two sectors on each wheel marked in brown (a “0” and a “3” on each wheel). When any of these brown sectors become empty (by moving a resource token out of it), the wheel’s pointer must be rotated clockwise until the brown sectors are no longer empty. This will frequently result in the quantity of “basic” resources decreasing and “major” resources (glass and bricks) increasing. This all may be hard to visualize, but I have included an image to the right that might help with understanding how this happens. In effect, you are using up resources (automatically, as you have no choice in doing this) in order to create the major resources, which will, of course, allow you to buy the more expensive buildings. 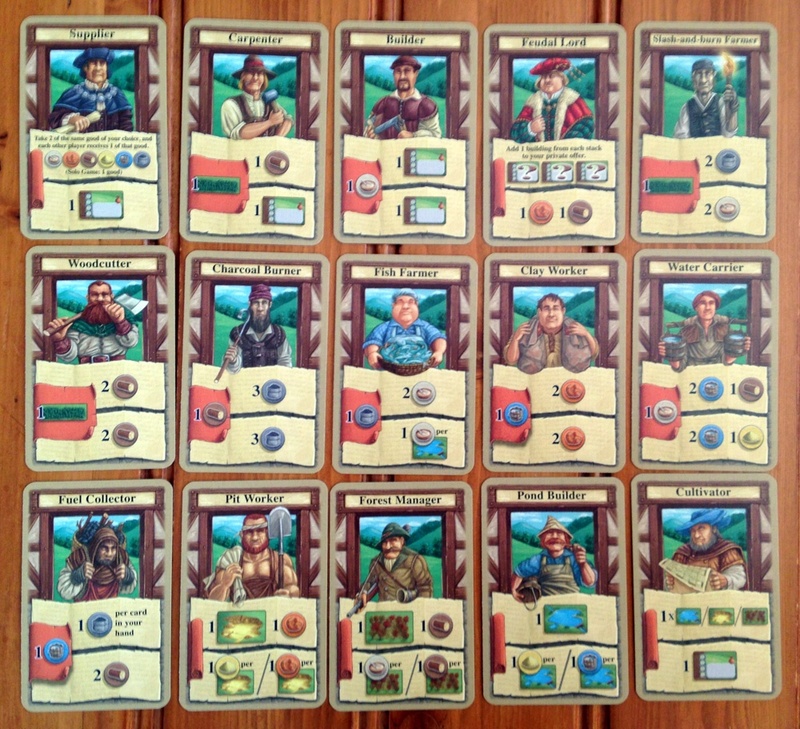 The game is played over 4 building rounds, and in each, a player chooses 5 of their 15 specialists cards to play. I have played Glass Road a few times now, once with 2 players and a few 3 player games. While the 2-player game was definitely fun, this seems to be one of those games where the more the merrier, or at least, the more competitive. The card-playing phase of the game is built around player interactivity. You are always trying to make intuitive guesses; not only about which 5 Specialist cards to use each building period, but more importantly, about the order in which to play them to maximize your actions. Players have to think: “I really want to take both actions of this card, but if I play it now, any of my opponents that have this same card will be forced to reveal it, and then I’ll only be able to take one of the two actions. Maybe I’ll try to select some cards that I think my opponents will want to play, so that I can reveal them when they play theirs, thereby cutting their action choices in half, while giving me an extra action at the same time.” This is one aspect of the game where I feel that more players increase the fun of the game: there are more chances to screw your neighbor (but of course that also means there are more chances to get screwed by your neighbor, so it’s a double-edged sword…). The building board will refresh each round with new tiles to replace the bought ones. There are many more tiles than a player could use in each game, allowing for a lot of replay value. I also have to mention how much I like the production wheels in this game. This is an awesome mechanism that Mr. Rosenberg has devised (and one that he’s planning to use in some future games as well – just so he doesn’t overuse it). The design of the wheels is so elegant, and you really have to pay attention to exactly what is happening every time you gain or spend resources. There were several times during my games that I was happy to increase a resource, only to forget about the “automatic” glass and/or brick production, and I would wind up losing resources I just gained. The rules actually suggest that to keep that from happening, you might want to consider leaving a less-important resource (like food or charcoal) on the 0 sector as a “wheel stopper”. There is a lot of strategy needed to successfully manage your resources, and it’s been my experience that repeated plays help you grasp the wheel concept a little better each time. There are three types of buildings in Glass Road: Resource, One-time Use, and Victory Point (from top down). As far as replay value, I would say that Glass Road succeeds there as well. Since there are almost 100 building tiles, and you’ll only see a fraction of those in a given game (even with 4 players), chances are that each game will feel very different, especially with different play styles needed to best benefit from what the current building tiles offer. Every building has different abilities, with various ways to earn victory points, so no two games should ever feel repetitive. This large variety of building tiles and their abilities is also used to great effect, although slightly differently, in Mr. Rosenberg’s other big game from 2013, Caverna: The Cave Farmers, so if you find that you enjoy that aspect of Glass Road, you’ll probably enjoy Caverna as well. If I had anything negative to say about Glass Road, it’s that it seemed to be over almost too quickly. Even when first learning the game, I kept wishing it would last a little longer. As it turns out, however, the rule book has a solution for that too. It is suggested that you can play additional building periods (they suggest 5) to lengthen the game. I haven’t tried that yet, but I see no reason why I wouldn’t enjoy it, now that I am familiar with the game. If you’re a fan of Uwe Rosenberg’s other titles, get this game. If you like having many – almost too many – strategic choices to make in each turn, get this game. 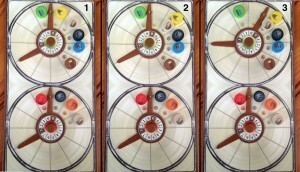 If the production wheel concept intrigues you, get this game. In short, if you want a good, fun, medium-weight Euro-style game add Glass Road to your collection. 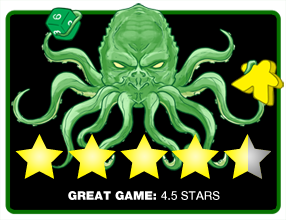 Final Score: 4.5 Stars – Another hit from Uwe Rosenberg. Glass Road combines quicker game play with some new and unique game mechanics. A win all around. • Fast and easy to learn and get into the game. • Many choices to be made all throughout the game, you won’t be sitting idle during other players’ turns. • 4 building periods feel a little too short for this game. • The theme is probably not as strong as it could be, but that’s somewhat typical for a Euro game.